A design classic in your home, but not in the usual way. 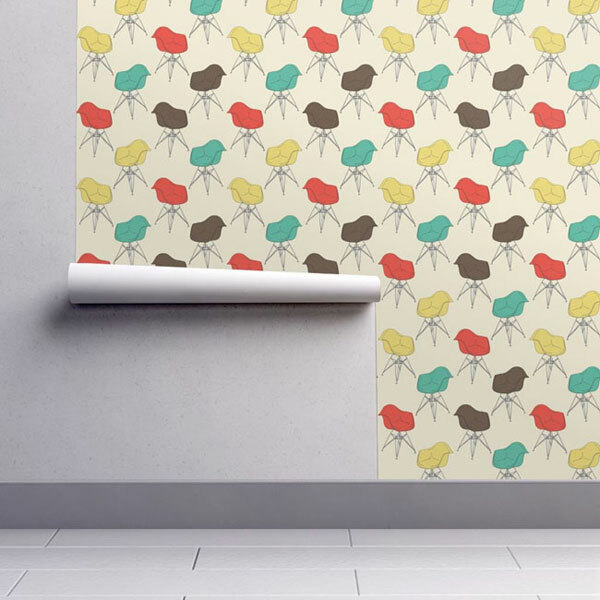 This is the Eames Armchair wallpaper by Marketa Stengl for Spoonflower. I probably need to clarify Eames Armchair, as it?s easy to think Eames Lounge Chair. No, this is the 1950s Eames DAR Armchair, the one with the moulded plastic seat and metal frame (or ?Eiffel Tower? base if you prefer). Still available and if you want one, you can grab one for just under £300 in a range of colours. Or you could stick with your existing seating and go for this instead. This is another design from Spoonflower. You might recall I featured them last year in relation to their range of authentic midcentury modern wallcoverings, all of which are worth checking out. But this is a new one and something of a quirky diversion, with a design packed full of those Eames chairs in various colours and at different angles. It?s an eye-catching design from distance and even more interesting when you close in. The paper is made to order and custom-printed in either a smooth water-activated wallpaper or woven peel-and-stick paper, with a 24-inch width and a variety of lengths, depending on what you need.